The Lab recently hosted an event in which some of our junior researchers joined their colleagues in a pseudo-historical reenactment scenario, facilitated by semi-randomized stochastic generation of personality proxies in a constructed-reality interactive discourse*. The mother of one of these colleagues (who has asked that she be identified by the alias ChopChop), knowing of my core research interests, brought over a variety of Asian Weirdness for sampling. She and I did a joint investigation of two of the examples (which will be posted soon), but she was kind enough to leave the rest for later consideration. Tonight, I'll be trying Gettin' Cool Strawberry Soda. Gettin' Cool also makes a melon flavor (I'll have to do that one). While there's nothing all that Weird about strawberry soda, the name "Gettin' Cool" provides a certain undeniable Weirdness. It also comes in the unusual torpedo-shaped screw-top metal bottle, which I have only seen in Japanese sodas. The small clay head is not necessary for Weirdness, but I think it does make a useful contribution. Color: I was expecting a frighteningly oversaturated red, but it's actually a pleasant pale peach-orange. Scent: Fruity, slightly tart, quite strawberry-ish. Actually not far from the scent of ripe strawberries, which is a very pleasant surprise. Taste: The initial taste is cool in the mouth, and has a berryish flavor, but sweeter than actual fruit--more of a mixed-berry preserves feel. The taste of strawberry is there, but it's as if there were also some raspberries and blackberries thrown in. It's very nice; I'm enjoying it a lot. Refreshing, pleasant, and not too far from real strawberry. A fine fruit soda. A few seconds later, a tartness begins to creep in at the edges. You think, "Ah, yes, here it comes. It was inevitable, I suppose, that an acrid, acidic, hideous hell-taste of corn syrup aftertaste would make itself known. Come on in, make yourself at home. No, I'm not busy, I was just enjoying this unexpectedly berry-like strawberry soda, thinking it might be something special, and then you had to come right along, didn't you? DIDN'T YOU? Well, I can't say I'm surprised." But then you really are surprised, because that taste never develops into the full flower of acidity which you've experienced so many times before. Instead, the tartness just sort of...hovers. It lingers, unwilling to come into the light. The acid aftertaste skulks around in the shadows at the edge of the room like a Quaffmaster at an eighth-grade dance, desperate for attention--affection--the smallest drop of feminine interest, yet knowing that such is not to be his. This tartness just drifts around, lingering by the snack table and desultorily snitching Chee-tos from the bowl, unhappy eyes on the whirl of gaiety, frivolity, and la-di-dah merrymaking occurring out there in the light, watching the cool people doing their dances and engaging in witty eighth-grade repartee**. This acid aftertaste can't quite get up the courage to step out and be itself, to say "Here I am, behold me!" Instead, it'll just grab another handful of M&Ms. Yes, this aftertaste doesn't quite come forward and grab the spotlight, it just sits there and makes sure you know it hasn't gone away. Quaff rating: 3.5. Pretty nice--surprisingly so. One of the better strawberry sodas I've had. Cough rating: 0.5; the persistent acid is the only problem. It's still there, by the way. *Also known as the Pathfinder role-playing game. This area of interest may, just may, be related to some of the other issues which came up in this review. *** I actually did get to dance with her, and even asked her to "go with me", which was quite the thing in eighth grade. A week later, she broke up with me, and published what amounted to a public denial of responsibility for the whole episode in the yearbook. I am thrilled to relay to you a guest review from a reader who identifies himself as "The Doc". Apparently, The Doc went out and got himself a sample of something called Inca Cola. Here it is, presented with no edits (as it is pretty freakin' splendid as-is): What's up, Doc? Widely recognized as the national soft drink of Peru, Inca Cola bills itself intermittently as "The Flavor of Peru," which suggests it tastes like human sacrifice, and this is doubly weird given that it was actually created by a British expat in 1935. Therefore, I am eminently certain this will be suitable as a Guest Review of a Weird Soda. However, I think the best summation was an shorter-lived slogan, "there is only one and Peru knows why" (we presume that the executive who came up with that was, indeed, executed), and we'll get to that. It is now distributed by Coca-Cola, who bought it out. For the purposes of this review, I (ab)used my staff members, who are eager to try anything as long as someone else is buying. Color: The beverage is yellow like serum, but this is to be expected given the murderous ritualistic name. Actually, it's yellow like radioactive serum, as if the master of ceremonies had plunged his knife into uranium yellowcake and then into his victim. It is, however, mercifully clear. Smell: Inca Cola is ostensibly based on lemon verbena, and you can get the lemon note immediately, but a stronger and more dominant note is bubble gum. All the staff agreed it smelled like that, as if someone had taken a bottle of Crystal Light and spilled it on a pack of Bazooka. It is quite strong if you're not expecting it -- not unpleasant, but intense. Taste: The smell is not deceiving: it tastes pretty much as it smelled. 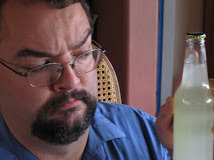 The initial lemon taste is immediately walloped by a Juicy Fruit-like flavor, and this then sort of erodes back into the lemon which has itself eroded into a decrepit bitter citron. It's sort of like being mugged after the mugger offers you a Sprite: the initial taste is nice, then you get clonked over the head, your wallet is taken (in this case around $3 for the sixpack) and waking up you're still reeling from the whacking with the taste of the Sprite getting bitter in your stomach and on your tongue. In small quantities it is actually not un-refreshing, and certainly perks you up, but when quaffed in full vigour will probably just give you heartburn after you finish gasping from the taste assault. Quaff rating: 3, if sipped. 2, if consumed recklessly. If sipped, it's rather nice. Otherwise, find some Pepcid and some ice for your head. Cough rating: Similarly, 1, if sipped. 2, if consumed recklessly. You will probably literally cough at that point. I can see why there is only one taste of Peru. I do keep some in my fridge for when I need something to perk me up, but that's about the only use I have for it. I have nothing to add, except that I am kind of choked up. That was beautiful. Beautiful.